As we get closer to ending the year and get ready to celebrate the new year, it is a perfect time to reflect and set intentions. 2018 has been a whirlwind of a year. As all the years that come and go, so many things happen in our lives that have an impact on us, whether it be positive or more challenging events. It's all a part of life. There is nothing to do but soak it all in and embrace the moments. Everything is part of our unique journey through life. 2018 was a special year for Moonchild and we are so grateful for all of you who have been part our journey. 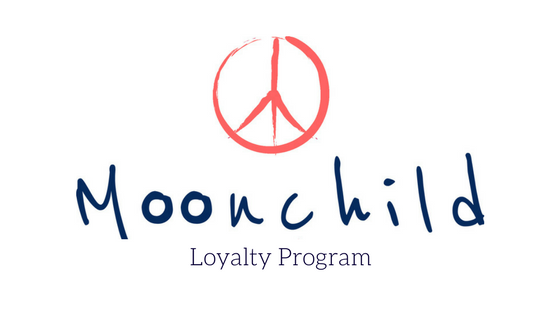 Two of our biggest moments this year, have to be our Moonchild Yoga Gathering events! Our first in the Dome of Visions in Aarhus, Denmark in May and our second at the National Museum in Copenhagen this October. It was incredible experiences to see so many of you come and celebrate life and yoga with us. We love those moments where we get to come together and connect with you, and hopefully give you a very special experience and connect you with other like-minded people. If you missed the events you can check out the highlights for Aarhus HERE and for Copenhagen HERE! Our work with Women for Women International to support women survivors of war has had a special place in our hearts this year. We all your support we have been able to contribute with financial support to this amazing organization so that we can help women to a better future. We are so grateful to be able to give back to those who need it the most! As we reach the end of the year, there tends to be a lot of focus on the year to come and focusing on New Years resolutions. Something that we want to pay attention to this year, and hopefully inspire you to do so as well, is to take some time to reflect. A year is 365 days. That is a lot of days filled with lots of somethings and also lots of ordinary days. What this means is that we tend to remember the big occurrences and tend to forget the little things, or ordinary things in our daily lifes. When in reality, these little things were the things that maybe made our days a little bit brighter or more enjoyable. Taking a couple of minutes to sit down, maybe with a journal and reflect upon both the big events that 2018 brought you, but also the little moments you experienced. Whether they were with friends or family, or maybe they were little moments with yourself. However you choose to reflect, take another moment, before you go on with your day to take a few deep breaths. Just let all these moment settle in your mind and heart. Intentions are different for everyone. Some see them as goals for then New Year, whether it be leaving a bad habit behind, picking up a new form of exercise, maybe it's to practice more yoga, and others see them as hopes and thoughts for the future. New Years intentions do not necessarily have to be specific, set in stone goals. They can simply be thoughts or maybe even feelings about yourself. This can be understood in the sense that maybe you want to start taking a moment everyday to let go of negative energy or thoughts, whether it be about yourself or about life itself. Maybe you have had a stressful year and you want to put more focus and energy into positively managing your time in 2019. Maybe your intentions for 2019 are much more broad and open. No matter how you view intentions, whether they be for a New Year or intentions in general, the most important thing is that you see them as positive things. They should not add extra worry or stress into your life. They should simply be little things which can guide you to a happier, healthy life. Below you will find some New Years intentions that we will be incorporating into our lives for 2019. Be open to those around you and be open with yourself. Explore, learn and discover through the people in your life and those you meet this year. Open your mind and heart to all the little adventures life will bring you. The world isn't always filled with positivity. But this should never keep us from being positive and sharing our positive energy with those around us! Positivity and happiness is contagious - so surround yourself with people who have this energy and share positive energy to those around you! Self care was a big topic 2018 and it should definitely continue into 2019. Taking care of ourselves is essential if we are going to be able to take care of and be there for those that we love. Remember yourself is about getting enough sleep, eating nutritious foods, stimulating your mind and body and doing things that you love with people you love. From the entire Moonchild family!